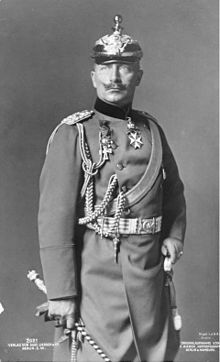 Friedrich Wilhelm Viktor Albert von Hohenzollern, Wilhelm II of Prussia and Germany, (27 January 1859 – 4 June 1941) was the last German Emperor and the last King of Prussia, ruling from 1888 to 1918. He went to live in the Netherlands and abdicated (resigned) as King and Emperor. He died at Huis Doorn and is buried there because he ordered that he did not want to be buried in Nazi Germany. Wilhelm died on June 4, 1941. Kaiser Wilhelm II was born on January 27, 1859. He was the oldest child in his family. His father was Prince Frederick of Prussia. His mother was Princess Victoria, the eldest daughter of Queen Victoria of the United Kingdom. He was born with a disabled left arm. He got married in 1881. His wife was Augusta Victoria. They had seven children. He studied at the Kassel Gymnasium, and later at the University of Bonn. He became leader of Germany in 1888 after his father died. He disagreed with his father's long-time Chancellor, Otto von Bismarck, and dismissed him in 1890. Wilhelm believed in strengthening Germany’s armed forces, especially the Navy. He led Germany during World War I. This page was last changed on 16 September 2018, at 13:40.